The IB series features extremely high input/output isolation in a miniature 1.5 watt package. Designed with a low profile and 24 pin DIP compatibility, the IB fits easily into PC board assemblies. High efficiency (>75% typical) is a result of state-of-the-art circuitry with an oscillator frequency greater than 50kHz. Dimensions: 1.25in. × 0.8in. × 0.4in. Notes: 1. 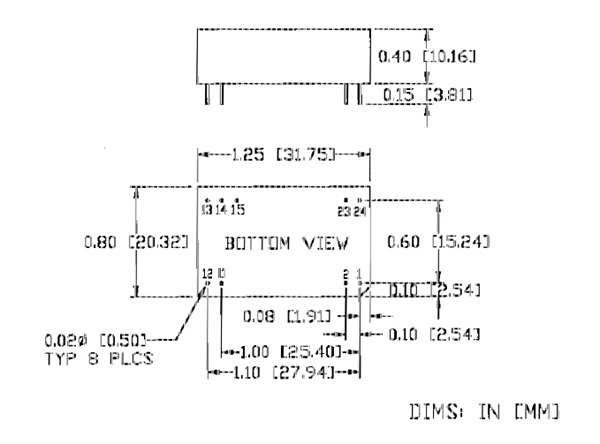 All case and pin-to-case dimensions for reference only, unless noted otherwise. 2. Pin details: eight pins (single output) nine pins (dual output) 0.02"diameter x 0.15" long. 3. 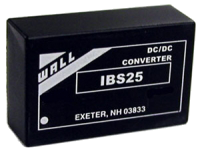 1500VDC I/O isolation, IBS248 package only.